There has been a lot of debate about Flash and HTML5 video ever since Apple and Steve Jobs took the decision to block Flash from their iOS operating system. Currently, iPhone and iPad users can’t view video or audio deployed on Moodle. Now the Media Player module for Moodle brings support for HTML5 video tags to resolve this issue. What’s the Media Player module? It’s a Flash based activity module for Moodle 1.8 and 1.9 that plays a wide range of media formats without the need for any special programming skills. Flash has been the de facto method for deploying audio and video on the web for at least the last ten years. Everyone uses it because it’s more stable, less intrusive and works in more browsers and on more operating systems than any other method. Basically, if you want the maximum number of users to be able to view your video content, Flash is the best choice. Not only does it guarantee the best compatibility available, it also has all the other advantages and advanced features of Flash. At the heart of the Media Player module is a stable, powerful and feature rich Flash based media player. It can play a wide variety of video formats and play video streamed from a media servers (RTMP) including live feeds and can switch between high and low definition video streams according to users’ available bandwidth. It supports a variety of playlists, Flash animations, audio, thumbnails and poster images, external caption files, external audio tracks, animated and/or interactive overlays and full-screen display mode. This is what sets the Media Player module apart from other methods of deploying media. Why include support for HTML5? A short while ago, Apple Inc. took the decision to block Flash from all their iOS mobile devices including iPhone, iPod and iPad. This means that Apple iOS users can’t view video on the majority of websites. Unfortunately, this also means that learners who have Apple iOS devices can’t view video or listen to audio deployed on Moodle. 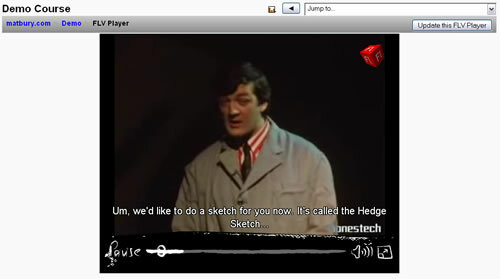 Subsequently, I have received a lot of requests for the Media Player module to support HTML5 video. Initially, because I designed the module as an advanced, interactive activity module for video, I didn’t think it was appropriate to support HTML5 video. However, on reflection, I’ve realised that the Media Player module is now the only viable way for non-developers to deploy video in Moodle to accommodate learners who have Apple iOS devices. What can we expect from HTML5 video? HTML5 video is a simple and quick way to deploy simple web video on browsers that support it. These currently include MS Internet Explorer 9 (but not IE7 or IE8), Apple Safari, Opera, Google Chrome and Firefox. However, HTML5 is not Flash and so we can’t expect the same advanced features. HTML5 supports RTMP streaming in theory but it’s dependent on users’ web browsers supporting it which, at the moment, most don’t. That brings me to two main caveats of using browser based video playback. The other; there’s currently a conflict between some powerful interested parties about which video CODEC to use. Firefox is pushing for the open source Ogg, while Google would like WebM and Apple and Microsoft would like to push H.264. Currently, this means that if you want to deploy video across all the main browsers using HTML5, you have to provide at least 3 versions of each video file: One as Ogg, one as WebM and one as H.264, tripling the required storage space for video on your servers. Luckily, it’s only Apple iOS that blocks Flash and Flash supports H.264, so if you deploy videos with Flash with H.264 and provide an HTML5 fall-back, you only need to provide one video file so you’ll get fully functioning interactive Flash video on all other desktops, laptops and mobile devices, and simple HTML5 video on Apple iOS devices; iPhone, iPod and iPad. Hopefully, the conflict between Firefox, Google, Apple and Microsoft for a video CODEC standard can be resolved and web browser developers can move towards more standardised interpretation and support of HTML5 video. There are also several projects under way for providing more feature rich video experiences and I expect that deploying web video without Flash will get easier.